Home // Posts tagged "Neurociências"
Abstract: Typically one expects that the intervals between consecutive occurrences of a particular behavior will have a characteristic time scale around which most observations are centered. Surprisingly, the timing of many diverse behaviors from human communication to animal foraging form complex self-similar temporal patterns re-produced on multiple time scales. We present a general framework for understanding how such scale invariance may arise in nonequilibrium systems, including those that regulate mammalian behaviors. We then demonstrate that the predictions of this framework are in agreement with detailed analysis of spontaneous mouse behavior observed in a simple unchanging environment. Neural systems operate on a broad range of time scales, from milliseconds to hours. We analytically show that such a separation between time scales could lead to scale-invariant dynamics without any fine tuning of parameters or other model-specific constraints. Our analyses reveal that the specifics of the distribution of resources or competition among several tasks are not essential for the expression of scale-free dynamics. Rather, we show that scale invariance observed in the dynamics of behavior can arise from the dynamics intrinsic to the brain. Este paper saiu em abril de 2012 e foi comentado na Folha de São Paulo. Ver também aqui e aqui. A forma como alguém conta uma história pode revelar muitas coisas, inclusive transtornos psiquiátricos. Pesquisadores brasileiros criaram um método que consegue identificar pacientes com esquizofrenia e com mania apenas usando a fala. 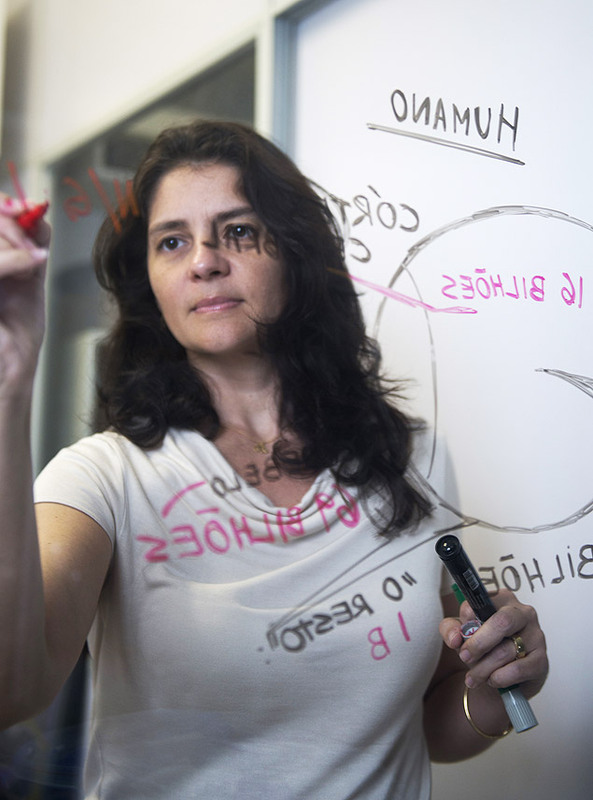 O trabalho começou a ser desenvolvido em 2006 e, ao longo do tempo, envolveu um time de cientistas de várias especialidades, liderados por uma equipe do Instituto do Cérebro da UFRN (Universidade Federal do Rio Grande do Norte, em Natal). 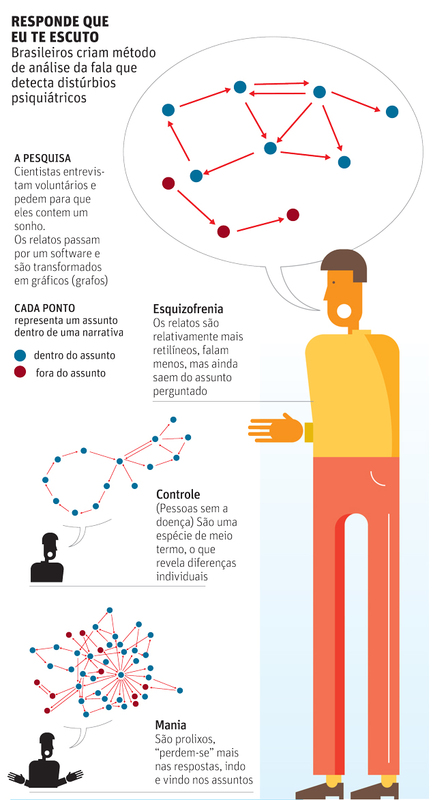 Os pesquisadores criaram um modelo que transforma em gráficos (grafos) o discurso dos pacientes. E, a partir desse padrão, é possível identificar padrões e correlações que são bastante específicos dessas duas psicoses. No experimento, os cientistas analisaram 24 pessoas, sendo oito delas com diagnóstico prévio de esquizofrenia, oito de mania e oito sem psicoses diagnosticadas. Se você está preocupado pelo fato de seu filho “gastar” horas em games em vez de “estudar para ser capaz de trabalhar”, o artigo abaixo sugere que você é adepto da filosofia Baining de vida. O que precisaria ser melhor estudado é que tipo de aprendizagem ocorre durante os games: Reações neuromotoras e tomadas de decisão rápidas? Habituação emocional em ambientes hostis simulados que lembram sonhos? Socialização em jogos online? Bom, uma tese de doutorado examina a aprendizagem através de games aqui. Bateson called them “drab and colorless:” The culture where play is shameful. Como colocar papers no ArXiv? Please share this with your co-authors. They may use it to claim ownership. and in gain control modulation. We analytically study the input-output properties of a neuron whose active dendritic tree, modeled as a Cayley tree of excitable elements, is subjected to Poisson stimulus. Both single-site and two-site mean-field approximations incorrectly predict a nonequilibrium phase transition which is not allowed in the model. We propose an excitable-wave mean-field approximation which shows good agreement with previously published simulation results [ Gollo et al. PLoS Comput. Biol. 5 e1000402 (2009)] and accounts for finite-size effects. We also discuss the relevance of our results to experiments in neuroscience, emphasizing the role of active dendrites in the enhancement of dynamic range and in gain control modulation. Thank you for choosing to publish with the American Physical Society. 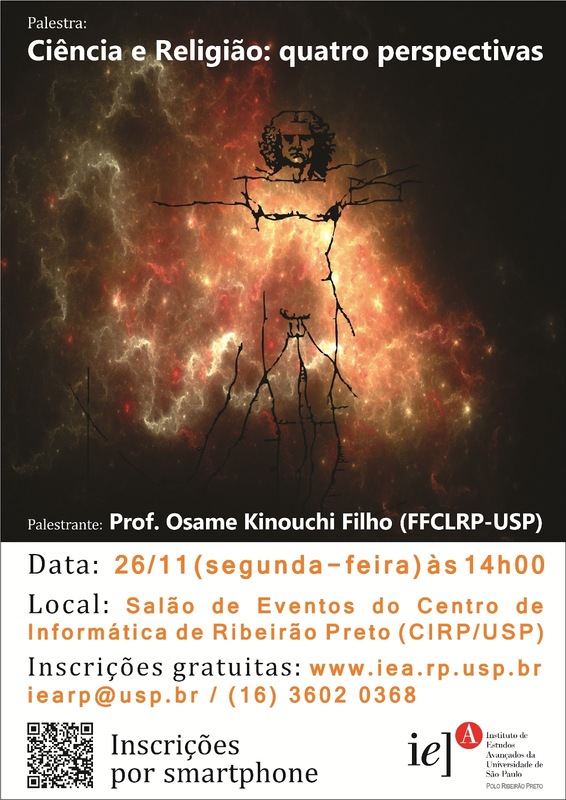 Entre 15 de janeiro a 10 de fevereiro de 2012 será realizada, no Departamento de Física da FFCLRP, sob organização do Prof. Dr. Antônio Carlos Roque da Silva Filho, a 4ª Edição da Escola Latino-Americana de Neurociência Computacional – LASCON IV. 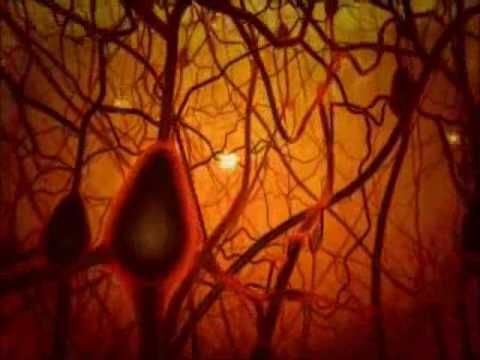 A escola terá a duração de quatro semanas e serão abordadas questões como: biofísico detalhados modelos único neurônio; modelos simplificados neurônio; modelos de rede neural; plasticidade sináptica e modelos de memória; modelos em nível de sistema cerebral; teoria da informação e análise de pico de trem, e neurociência cognitiva computacional. Estes modelos serão ilustrados com o uso de programas como neurónio, neuroConstruct, XPP-AUTO, NEST e Matlab. O corpo docente é composto por uma equipe internacional de pesquisadores de renome mundial no campo da neurociência computacional. 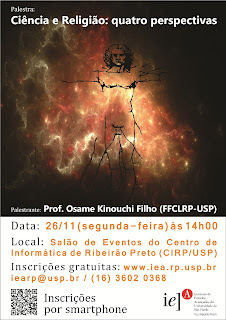 O evento será realizado em período integral (manhãs, tardes e noites) no bloco 1 das exatas (prédio do Departamento de Computação e Matemática). Vocês lembram que havíamos combinado que faríamos uma reuniao de “skype com cerveja” para discutir sobre diversos projetos e sobretudo coisas da vida? Havia entretanto a ressalva que esta reuniao só deveria acontecer depois do PRE ser aceito. Pois bem, comunico que já podemos fazer nossa reuniao! Entao, qual é o melhor dia pra vocês para o skype com cerveja? Parece que ser gentil realmente dá certo! Thank you for your explanation, my understanding about your paper improves much with your help. Your warm heart impresses me! The model studied is a general one, that is, an excitable media with probabilistic couplings. The level where we can apply such model depends on the interest of the researcher: the elements could be persons in a epidemiological model (so, our model would be a probabilistic SIRS model), a neuronal network model (with excitatory couplings), a model of a glomerulus in the olfactory bulb (the particular application that we made in the paper), a mean field model of a dendritic arbor (see reference bellow) or even as a model of sensor networks of bacteria (to model bacterial chemotaxis). The particular level which you desire to apply the model will constrain and set the acceptable parameter ranges. If you are interested to model excitatory networks of neurons, you are right that one shoud use n=3 or n=4, so that the refractory period is similar to the spike width. As you can see in Eq. (3), the refractory time governed by n affects the results only quantitatively, not qualitatively. We have studied all the cases from n=3 (that is, if spike = 1ms, then refractory period = 1ms) up to n = 10, but reported only the n=10 case because indeed we was interested in large refractory periods in the glomerulus (the particular application wich we made at the final part of the paper). As stated in the pag. 349 of the paper, we have also studied the case with assymetrical p_ij and no difference is found. The reference to synchronization phenomena in the glomerulus is made as evidence of the presence of gap junctions in that system (More strong evidence is by now avaiable by the recent direct observation of such electrical synapses). If we apply external inputs to the system, synchronization appears, as can be seen in Fig.2c and 2d. This sinchronization under inputs is what is observed in the experimental papers. Only the spontaneous activity is in the form of avalanches, as found in experiments by Plenz. Our couplings are fast in the sense that there is no delay times at the couplings, when a site is excited, the neighbours could be excited at the following time step, without delay. I hope that these observations coul be useful for your interests. 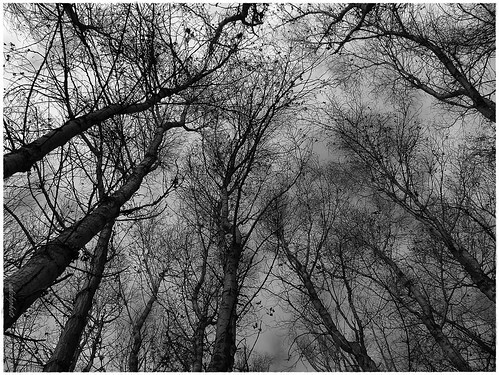 Presently we are working with dendritic computation, with a similar model in a tree structure, see here and here. In this model the refractory period is small and the couplings vary from the symmetric case to the full assymetric case. model. It seems not so reasonable. I wonder what makes you do such an adventurous hypothesis. Second, in your paper, you mentioned many times about the electrical synapse. The electrical synapses have two properties, it is fast and symmetrical. But I cannot figure out what ingredient in your model represents the property of “fast”. As to the property of symmetrical, you assume that p_ij=p_ji; but I don’t know whether the network can still perform so well without such symmetrical property. Have you done such a simulation on your computer? How the result? What’s more, still about the electrical synapse, you refer some articles about the electrical synapses and the synchronization of the network in your paper. But I’m afraid I still cannot figure out what’s the relationship between the contents of the papers you mentioned and the content of your own paper. 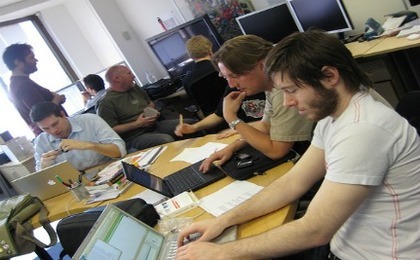 It seems that there is nothing about synchronization of the network in your paper. I am not sure about what is your question. The model is simply a generalized Greenberg-Hastings cellular automata in a random network where the conections p_ij are draw from a simple uniform distribution in [0,pmax]. Notice however that the mean field calculation assumes that p_ij = p (homogeneous network) and that this approximation seems to describe the behavior very well. If you are having any difficulty to reproduce the results, I can send you more details about the exact procedure for the simulations. I’m a Chinese student, recently I’m reading your paper “Optimal dynamical range of excitable networks at criticality” published in Nature Physics. However, I’m really puzzled by the model you proposed: where does it come from, how do you think out? Could you explain about it for me? 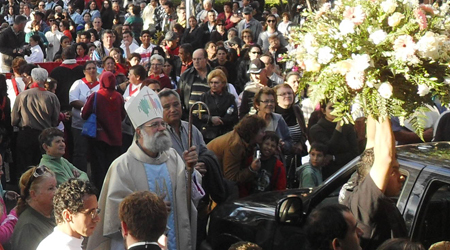 Chegando o Natal começa aquela ladainha sobre Jesus e Papai Noel, meus amigos cristãos reclamando que o capitalismo coloca Papai Noel na frente de Jesus e alguns dos meus amigos ateus hateando que tanto Papai Noel como Jesus são personagens igualmente míticos. Ah sim, também tenho amigos que não falam nem de Jesus nem de Papai Noel para seus filhos pequenos e os presentes de Natal são dados ou em homenagem ao Deus-Sol Apolo Invictus – no solstício de verão que cairá no dia 22 de Dezembro às 5:30 h neste ano, ou no dia de Reis, 6 de janeiro, não sei exatamente por quê. Meus filhos não receberam educação religiosa mas acho que sabem pelo menos quem é Davi (ou pelo menos, como Davi venceu o gigante Golias, de modo que eles, sendo baixinhos, também não deveriam ter medo dos grandões). E, claro, foram educados acreditando em Papai Noel e Coelhinho da Páscoa. Lembro-me de um jantar maravilhoso na época de Natal onde Leonardo, Raphael e eu discutíamos sobre como é possível Papai Noel entrar na nossa casa, dado que ela não tinha chaminé. Aventei a hipótese de teletransporte, acho que falei também sobre a possibilidade de um Papai Noel quântico que pudesse, numa superposição de estados, estar em todas as casas das crianças ao mesmo tempo. Algumas pessoas me criticaram por encher as cabeças dos meus filhos de mitos, fantasias e ficção científica. Bom, minha desculpa é que eu sigo o preceito de Einstein acima, afinal quero que meus filhos sejam inteligentes e criativos. Isso parece ter dado certo: Mariana (18) sempre foi a melhor aluna da classe e cursou todo o ensino médio sem pagar nada, pois ganhou uma bolsa num vestibulinho em que ficou em primeiro lugar entre 100 candidatos. Juliana (15) acaba de ler Sartre (depois de passar por Spinoza e Aristóteles). Dado que ela tem apenas 15 anos, acho que é um feito (eu mesmo li muito poucos desses autores). Mariana e Juliana acabam de passar na primeira fase da FUVEST, o que me parece promissor, dado que Mariana namorou e vagabundeou o ano todo – segundo suas próprias palavras, e Juliana está ainda no segundo ano e não fez cursinho. Sim, Raphael é meio empirista e positivista lógico: na época ele ainda acreditava em Coelho da Páscoa dado que havia amplas evidências observacionais – ovos de Páscoa, rastros do Coelho pela casa, evidências televisivas etc. Preciso ensinar para esse menino que Popper destruiu tanto o Empirismo quanto o Positivismo. Assim, sigo o mestre Einstein e sugiro fortemente que eduquem seus filhos usando contos de fadas (a série sobre tecnofadas Artemis Fowl é um bom começo, muito melhor que Harry Potter). Se você discorda de mim, eu fico com apenas três hipótese: ou você não tem filhos, ou se acha mais esperto que Einstein ou tem os alelos AA ou AG no gene OXTR para o receptor de Oxitocina… provavelmente os três!